120ml E Liquid Bottles comes with safety seal, child safety cap and twist top fill tip. OUR120ML BOTTLES NOW COME IN CHUBBY GORILLA BOTTLES! 5% BACK ON JUICE WITH TVR POINT REWARDS! Every bottle of Ginger’s USA Blends is hand mixed in-house using the most pure ingredients possible. Because every bottle of TVR Juice is made fresh, we recommend letting our Juices steep for 4-6 days so the flavor can reach its fullest potential. NOTE: You CANNOT use WINTERGREEN, CINNAMON RED HOTS, APPLE PIE with the Plastic Clearomizers. These flavors will DAMAGE the Clearomizer! We will NOT replace Clearomizers damaged by using these Flavors. FLAVOR SHOT OPTION: This option is for those of you who prefer your juice to be stronger in flavor or are using a high voltage mod. We do not recommend starting with any flavor shots because the juice flavors are set to bring out a balance of natural flavor with out any shots with a steeping time of 4-6 days. A single flavor shot is the addition of 1/4 of the initial flavoring added. A double shot is the addition of 1/2 of the initial flavoring added. Be careful when adding a double shot since this is a big increase in flavoring and may not be best suited for some flavors as it can leaving an unnatural taste. ALL PLASTIC BOTTLES COME WITH CHILD SAFETY CAPS. RATIO OPTION: PG 75/VG 25: This is a thinner mixture consisting primarily of PG. It is very flavorful with great throat hit and moderate vapor production. Great for lower voltage devices like the 901 and 510. PG 50/VG 50: Ginger's Perfect Blend! It offers the best balance of throat hit and vapor production without sacrificing flavor. Great for 3.7 volt+ devices. PG 25/VG 75: This is a thicker mixture. It gives you rich, dense vapor with a slightly less intense throat hit. 100 VG: This is the thickest mixture we offer, giving you the fullest vapor production available. Great for high voltage devices and for those sensitive to PG. 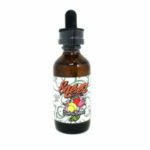 *Note: Green Apple, Sweet Tangerine, and Orange Creamsicle are very light on flavor and throat hit. This is because of how those flavors have to be made. *Note: Using 0mg Nicotine can affect the Flavor of E-Liquids. No refunds will be given based off dislike of a flavor.